ET AGRICULTURE – FREE & PREMIUM JOOMLA! TEMPLATE is Responsive Agriculture Joomla template that targets for crop farms, cattle farms, farmers’ markets and agriculture website. With Agriculture Website Templates, you can set up a polished, exquisitely designed website in no time. This agriculture website is built with latest Bootstrap CSS Framework, Support Font Awesome and K2 extended style. It’s 100% responsive by nature, so they render well across all platforms – mobile and desktop ones likewise. It comes with 4 color schemes helping to create excellent websites with various layouts. Savory Eat – Delicious Restaurant Joomla Template will help to make a perfect first impression both on your constant client and potential visitors. The design looks as gorgeous as an expensive post card, the photos are bright and make the observer feel hungry. All the photos are included in the template pack and ale completely at your disposal. The template has convenient and understandable booking form, detailed menu functionality and reviews block. ET COFFEE – FREE & PREMIUM COFFEE SHOP JOOMLA! TEMPLATE is Responsive template that targets for coffee shop website template or restaurant website templates. This gorgeous Coffee Website Templates will help to put your business online and share it on social media. Each theme is responsive, allowing you to target more people and they come pre-integrated with social options. This helps viewers to share your pages and products via social media, thus improving your presence and reputation in the online world. Coffee Website Templates are extremely simple to install and configure, and they don’t require a big amount of money and time investment. ET WINE – WINERY JOOMLA TEMPLATE is a well-organized Responsive Winery Joomla Template which is intended for kinds of wine websites. Considering we live in a world of new technology, Wine Joomla Template is 100% responsive and supports cross-browser compatibility. This allows mobile device users to access your site as well. Thus your wine websites will gain more viewers every day and your base of clients will definitely increase. This template is well-designed on powerful framework based on Bootstrap CSS grid layout, Page Builder for layout, Shortcode for editing information quickly. ET FRUIT – ECOMMERCE FOOD JOOMLA TEMPLATE is Responsive Joomla! template that targets for fresh, canned, selling fruits or organic food website. This is the perfect solution when you are trying to answer possible clients’ request for natural, bio fruits. Easy to install and configure, our Organic Food Joomla! template will support your efforts as a small producer. By setting a gorgeous online theme, your products will definitely become popular among internet users. High-quality images presenting the items in detail, displayed in a modern slider using smooth visual effects. 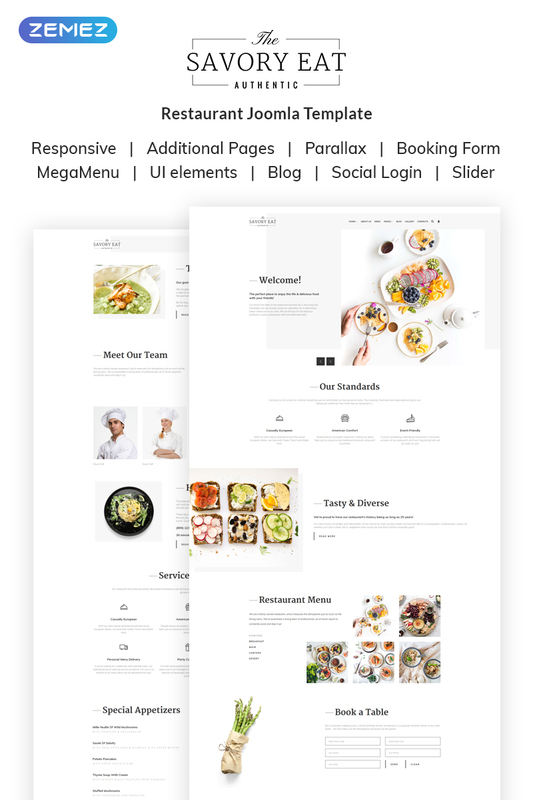 Alberto – Restaurant Joomla Template- nice and responsive Restaurant Joomla Template will help you to create a fast, stylish and well-organized website for your business. It’s an almost ready-to-use website with multiple layouts and pages that will work equally fast on any type of devices, including mobile. It should be noted that in the list of functions of this template there are all the tools for your project to have a chance for a quick startup. ET TEA – RESPONSIVE JOOMLA! TEMPLATE is Responsive Joomla! template that targets for tea company website. Tea Company Website Template is supported by Google Fonts, which means that your blog posts and recipes will be easy to read. You also get access to a wide collection of high-quality stock photos to make the posts more interesting. All these contents can be managed through the Admin Panel feature, which has a user-friendly interface. ET Tea builds with latest Bootstrap CSS Framework, Support Font Awesome and K2 extended style. ET ICECREAM – ECOMMERCE JOOMLA! TEMPLATE is Responsive Joomla! template that targets for ice cream store website. This is a high-quality professional website for your business. Use your gallery to post images of your delicious ice creams or equipment. You also get access to free high-res stock photos and images. That’s why we created Ice Cream Joomla! Template to entice shoppers before they even step through your door. Our Ice Cream Joomla! Template have been thoughtfully created by top developers with your needs in mind. ET RUSTRO – RESTAURANTS JOOMLA! TEMPLATE is Responsive Joomla! template that targets for Bars, Cafe, Restaurants websites and any site related to food industry. ET Rustro is specially designed and coded for the restaurant business. Our easily customized slideshows will immerse your customer in beautiful pictures of your culinary creations. Easily create multiple pages to display pictures and descriptions of your specialty dishes. Smooth scrolling customizable menus make it easy for your customers to navigate to your latest mouth-watering masterpiece. Colors are used to blend your website with your cuisine. ET FAST FOOD – RESTAURANT JOOMLA! TEMPLATE is Responsive Joomla! template that for fast food website. Our Joomla Restaurant Template is specially created to offer fast food restaurant owners the possibility to develop without spending a fortune on online marketing. That’s why we used high-resolution images with healthy fast foods that look delicious and make the viewers wonder about its taste. It builds with latest Bootstrap CSS Framework, Support Font Awesome, J2Store and K2 extended style. Fast Food Website is energetic and it motivates people to visit the restaurant while keeping it simple for the administrator. LT BBQ – RESTAURANT JOOMLA! TEMPLATE is a Responsive barbecue template which is nicely designed for diversity kinds of restaurant websites like barbecue restaurant, food center. The Barbecue website template is easy to use, stylish and will allow you to develop a specialized website without having to employ an expensive web designer. This template framework comes with Page Builder for layout, Shortcode for present content easily. Your chosen template comes with a personal panel full of widgets and modules you can use to fulfill your specific needs. LT BBQ – Premium Barbecue Joomla Template is a Responsive barbecue template which is nicely designed for diversity kinds of restaurant websites like barbecue restaurant, food center. The Barbecue website template is easy to use, stylish and will allow you to develop a specialized website without having to employ an expensive web designer. This template framework comes with Page Builder for layout, Shortcode for present content easily. Your chosen template comes with a personal panel full of widgets and modules you can use to fulfill your specific needs. LT Disco – Premium Private Club Joomla Template is a good-looking template which is intended for night club, bar, or discotheque. Club Joomla template built on powerful framework with fully bootstrap, strong shortcodes, unlimited position and easy to custom layout without code modification. Created basically on the latest Bootstrap CSS Framework and supports Font Awesome, extended K2 style, and many more. Our Club Joomla template use high-quality images to inspire an atmosphere of fun and relaxation where anyone can charge up after a difficult day. Grilling barbecue is a fully responsive Joomla template built on T3 framework. This template requires no framework plugin to be installed in order for it to work. Grilling barbecue will never be the same with this tasty-looking Joomla template. The responsive design makes it easily adaptable for all screen resolutions. The stylish and easy to use admin panel together with a wide range of customizable features enables the creation of an elegant looking site. It is designed with a cafe and or restaurant in mind to give you that feel-good experience. LT BeePub is Responsive Bar or Bistro Joomla template. It’s got everything you need to showcase your best bistro. Bringing out the best in those beers by showcasing them in your bistro website can be tricky. But more importantly, Bistro Joomla Template are equipped with features that will allow your members and visitors to engage in your booking a table online. The blog would be perfect for regular content while the gallery is a great place to show off your best beer. The templates come with high-quality stock photos that will look great in any bistro website. LT Donut is Responsive Joomla template that targets for Bread Store or donuts Joomla template websites. This template promotes fantastic images with photos of colorful donuts to offer your bakery a unique way and draw customers’ attention to your confectionery. In addition, you can introduce your most popular products, promotions and delivery options. Give your customers a chance to browse and order their favorite products online. Donut Joomla template builds on powerful shortcodes, unlimited position and easy to drag-drop layout content. Responsive layout smoothly adapts to all mobile devices. Besides, it also comes with 4 color styles helping to create wonderful websites.